Estimating construction materials starts with a basic count of the framing lumber, often called a framing takeoff. A takeoff for a wall frame includes counting the studs (typically 2x4 or 2x6), the headers for door and window openings (using 2x12s is simplest), and horizontal plates for the top and bottom of the wall (plates use the same lumber as the studs). In addition, your framing takeoff may include ​calculating the number of sheets of sheathing required for the exterior side of the wall. It's easiest to do a takeoff when you're working from a set of construction plans or at least from a rough sketch of the wall frame. 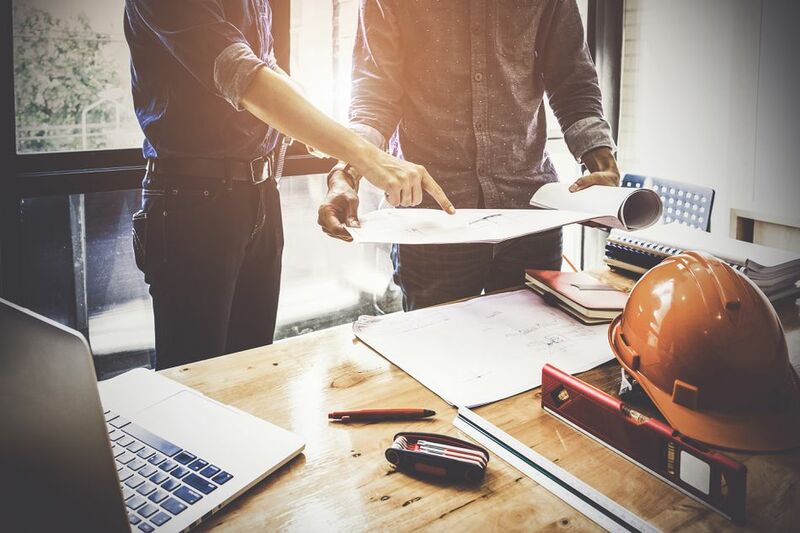 If you don't have construction drawings, start by creating a sketch of the wall to identify the overall length and height of the wall and the size of all door and window openings. Determine the "on-center" spacing of the wall studs: the distance between the centers of neighboring studs. Standard stud spacing is 16 inches on-center. Also, note any corners in the wall or places where the wall intersects with other walls. Standard frames for load-bearing walls include a single bottom plate and two top plates. To calculate the linear feet needed for the plates, multiply the total length of the wall times 3, then add 5 to 10 percent for waste. For example, if the wall is 20 feet long, you would need 60 linear feet of plate lumber plus 1 to 2 feet for waste. Depending on the length of the wall, you may decide to use single, full-length pieces for each plate. If the wall will stand on a concrete floor or foundation, the bottom plate must be made of pressure-treated lumber. Multiply the total wall length (in feet) by 0.75 (for 16-inch on-center stud spacing). Add three studs for each 90-degree corner. Add four studs for each 45-degree corner. Add two studs for each wall intersection (where another wall abuts the wall you are estimating). Add two studs for each opening that is 5 feet wide or less. Add one stud for each opening over 5 feet wide. Multiply the total count by 1.15 to add 15 percent for waste. Headers for standard-size doors and windows often are built with two pieces of 2x12 lumber sandwiched over a piece of 1/2-inch-thick plywood cut to the same size as the header. The total thickness of the header is 3 1/2 inches to match the width, or depth, of a 2x4 wall frame. To estimate the framing materials for each window and door opening, use the total width of the opening plus 7 inches. For example, for a 36-inch wide door, you need two pieces of 2x12 at 43 inches and one piece of plywood at 11 1/4 inches (the actual width of a 2x12) by 43 inches. Add extra stud material for fire blocking, structural connections, window sills, temporary bracing, and other additional elements, as needed. Multiply the total height and length of the wall to find the total area. Multiply the width and height of each opening to find the area. Subtract the area of the openings from the total area of the wall. Divide the result by 32. Round up to the nearest whole number; this is the number of sheets needed to cover one side of the wall. For example, if the wall is 8 feet tall and 20 feet long, it has a total area of 160 square feet. If there is a 4-by-5-foot window opening, the total area to cover is 160 - 20 = 140. Divide 140 by 32 to get 4.375. Round up to 5. This wall requires five 4-by-8-foot sheets of sheathing.